This semester I am enjoying a class on US history between 1877 and 1916. One of the first discussions we had in the class was about the boundary dates of the period. Even the professor isn’t completely sure why the class ends at 1916. World War I or America’s shift toward world power, we posit. But 1877 is definitely significant — it marks the end of Reconstruction. Reconstruction is by all accounts a colossal embarrassment to America. A survey of the historiography of Reconstruction sees scholars hashing out why it was a failure, but no one denies that it remains one of the darkest periods in American politics, according to my professor at SF State, Steve Leikin. What ends up happening is that a relatively progressive attempt to do right by the freed slaves devolves into a situation that does not differ so greatly from the situation before the War. In fact, it ends up arguably worse. After Northerners turn their attention to other matters, the Southern states regain “home rule” and immediately enact Jim Crow laws to institutionalize segregation. The 13th, 14th and 15th amendments that are supposed to do right by the freed slaves are eviscerated by a series of Supreme Court rulings that limit their reach (Leikin). This is the world from which W.E.B. 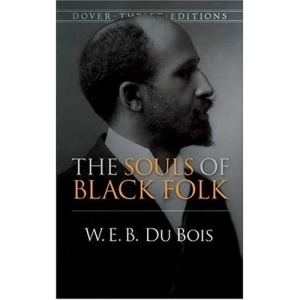 Du Bois sends us a letter in his 1903 collection of essays The Souls of Black Folk. Delivering an eloquent argument that “the problem of the Twentieth Century is the problem of the color-line,” Du Bois writes as a scholar of history, a scholar of sociology, and also as a fiction writer. He appeals to both rationality and emotion to achieve his goal of humanizing the problem for his readers. One of the most striking essays to me is “Of the Black Belt,” in which Du Bois describes a train ride south from Atlanta into the heart of the former plantation system. The tone is descriptive and journalistic — it feels like it could be on NPR today. He describes so vividly the decay, the pines reaching out of the red earth, and the dejected, lost black faces that peer out of decrepit cabins at him as he traverses the country. He paints a picture of a race cast away and abandoned. The perhaps well-intentioned Northerners destroyed the South to free its slaves, and then simply turned them out on their own with very little assistance — not every freed slave got 40 acres and a mule. Ironically, blacks and whites were perhaps more integrated under slavery than after. In 1903, the plantations are gone, the whites have fled, and where blacks and whites do coexist they segregate completely. In reading “Of the Black Belt,” I am struck by a feeling that this South, this hot, seething, segregated South does not go away. It’s the South that fuels Faulkner and O’Connor. It’s the South where lynchings occur well into the 20th century and James Byrd, Jr. is dragged to death in Texas even in 1998. It’s the South where the Civil Rights Movement at long last emerges in the mid-1900s and demands a place at the American table for African-Americans — at least in theory. But I can’t shake the feeling that the problems created during Reconstruction are still with us, and not just in the South. Nationwide, African-Americans are still economically disadvantaged as a group. There is still discrimination and inequality. And we’re still segregated into neighborhoods by race, here in San Francisco. We’ve inherited the failure of Reconstruction, generation after generation. Definitely read The Souls of Black Folk if you have the chance. It is a vivid picture of a terrifyingly unevolved period in our history, and I think it teaches lessons we still need to learn today. There’s another book I really want to read as well — Reconstruction: America’s Unfinished Revolution, 1863-1877 by Eric Foner. And I say all this with an immense love for the South, of course. I am a Southerner, after all, and I tire of South-bashing — which occurs more frequently than Southerners might realize. I really want to take a grand tour of the South soon. I have only really been to Atlanta and New Orleans, outside of my Upper South haunts, of course. Maybe after school!